If you're looking for somewhere off-the-beaten-track, away from the crowds, and new terrain to explore, Kimberley Alpine Resort might just be the one for you. Boasting North America's largest area of gladed terrain, the skiing possiblities at the resort are definitely not to be ignored. Over 1800 acres of terrain, and 80 runs and glades make up Kimberley, with plenty of options for beginner to expert skiers and snowboarders - from great fall line tree runs and finger-biting steeps to fun and cruisy groomers. Team this up with over 12 feet of annual snowfall, the most bluebird days of any resort in BC, true ski-in/ski-out accommodation, and a laid-back, genuine Canadian ski-town atmosphere, Kimberley should be your next stop on your Canadian ski adventure. For accommodation enquiries and packages, please contact us at Scout for the best deals. The most bluebird days than any other resort in BC! Night skiing - the longest lit run in North America! Follow the kids through the Kimberley Kid's Trail for some fun, but make sure to duck! Bring goggles for sunny days, as you'll use them the most! 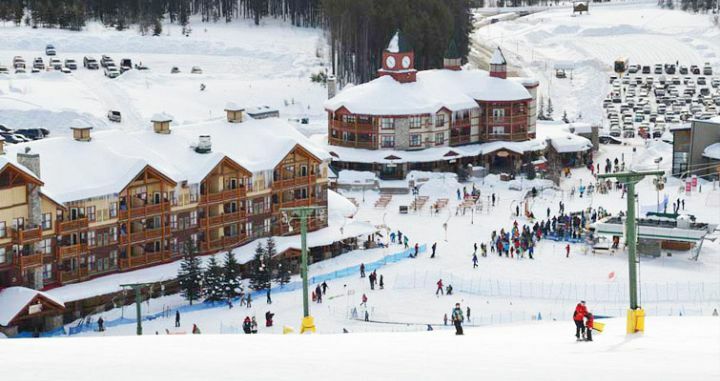 Kimberley Alpine Resort is an incredibly under-rated ski destination. It has that quaint and homely small town charm that we like to see when visiting Canadian ski resort, and a laid-back friendly atmosphere throughout the resort and the small mining town of Kimberley itself. This definitely reflected on the slopes - no crowds, long groomed runs to cruise around, and a seemingly non-hurried skier vibe. No competition for fresh tracks in the Glades, and barely any lift lines. Not to mention the countless bluebird days we had to be able to really explore the resort to it's fullest, and enjoy views of the incredible Canadian Rockies. Kimberley doesn't seem to receive the incredible powder days like other resorts in BC, however, the snow is great quality, and you'll be finding little stashes throughout the day. Kimberley is highly recommended for families, especially those on a budget as the resort is a much more economical option than other resorts in BC. It has all the facilities needed, but without the crowds and lift lines, which can be stressful for some parents. Staying on-mountain is a great choice if you wanted life to be a little easier every morning, and the ski-in/ski-out acess is well appreciated. The restaurants and bars can seem a bit repeatative after a few days, so jump on the bus into town for a night or two, and a good Canadian mountain town experience. Skiers and snowboarders will enjoy over 1800 acres of terrain at Kimberley, and over 80 named runs - that's a mammoth amount considering the resort has 'North America's Largest Gladed terrain' to explore. The resort is best suited to intermediate skiers. The Glades is the most popular spot for powderhounds, and it's definitely worth catching the first chair for some great tree skiing. The Easter Bowl particularly has those steeper runs and perfect fall lines that advanced skiers yearn for. Stick to the front face of the mountain for super fun and cruisy groomed runs, and with a lack of crowds, there will be plenty of space to perfect those turns. All the runs seem to funnel back into two distinct areas (frontside and backside), perfect for families and kids. For the kids, the Kimberley Kid's Trail is a heap of fun - a great spot for them to explore deeper in the woods, and ski away from their parents. Keep an eye out for the dummies spotted throughout the forest, and make sure you maintain a good tuck if you are game to follow the little ones through the runs. You can't miss the night skiing at Kimberley - running 3 nights a week (Thurs - Sat), you can ski under the stars on the longest lit run in North America! The resort is only serviced by 3 main lifts, and can be a little slow at times, however, with no crowds or competition for fresh tracks, there is no real hurry to get to the top. Sit back and relax and enjoy the view of the surrounding Purcell Mountains. Kimberley is a fantastic choice for families. The terrain is well suited to beginner to intermediate skiers and snowboarders, with a newly enhanced beginners-only area serviced by a magic carpet. The Kid's Learning Area is adjacent to ski-in/ski-out accommodation, so parents can keep a watchful eye on their children's progress (whilst enjoying a slope-side hot tub). The rental facilities and snowsports school are also well organised. The village skating pond is a big hit for the kids, and they will enjoy roasting a few marshmellows over the bonfire. There are limited on-mountain dining and retail option, so most families head into the town of Kimberley, where there is easy access to a larger range of restaurants, bars, and convenience stores. The on-mountain accommodation is perfect for families, with plenty of condos and townhouses with fully equipped kitchens. On-mountain accommodation is limited, however, if you were after ski-in/ski-out, it's a great spot to make home base for your holiday. Choose from a range of lodge rooms, condos, and townhouses, all self-contained and easy access to the slopes. Trickle Creek Lodge is a popular choice, located right at the base of the express chairlift. The only downfall to staying on mountain is Kimberley is not over-developed, so you have limited options in regards to eating out. Alternatively, the small mining town of Kimberley offers many hotel, motel, and even hostel options to suit any budget. These are generally less in price, and you have a larger range of restaurants, cafes, bars, and retail options. Kimberley does offer some other activities besides downhill skiing, including cross-country, dog-sledding, snow-shoeing, snow-mobiling, and scenic helicopter flights. Many can be booked directly with the resort upon arrival. The ski resort itself is located in the East Kootenays region of BC. The easiest option for skiers is to catch an internal flight from Vancouver or Calgary to Cranbrook airport, where the resort is only 20 minutes away by resort transfer. Kimberley is approximately 400km from Calgary, but the drive is quite spectacular through the mountain ranges. Kimberley town is only a few minutes from the resort (4km), and a community bus travels between the resort and town hourly. Taxi is also an easy option after 9PM. The ski season runs from early December through to mid-April. January is known to be particularly cold in BC.